2017 Annual Bandit Run – Smokey & The Bandit’s 40th Anniversary. 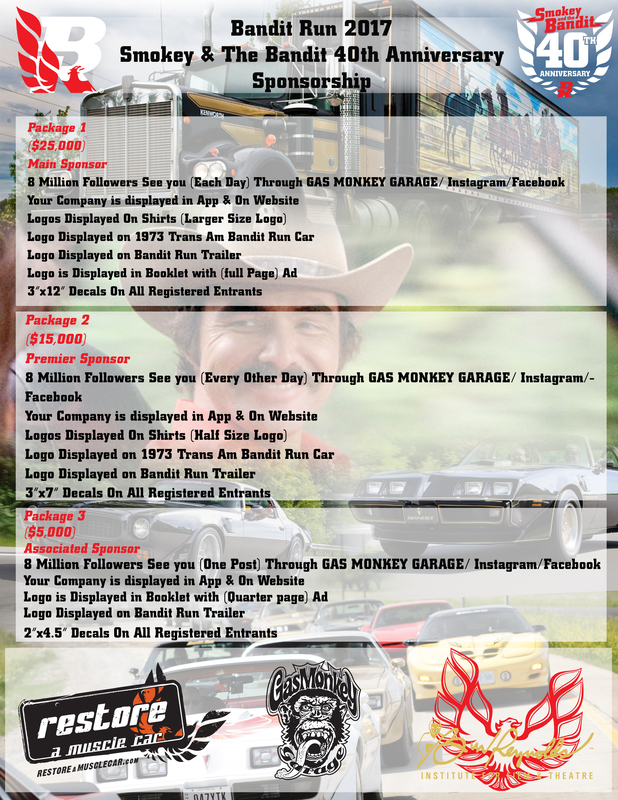 We are offering sponsorship packages to our Premier Suppliers to be included in this year’s Bandit Run. As you know the Bandit Run is in its 11th year, this year is going to be the highest attended to date. With appearances by the Bandit himself, Mr Burt Reynold’s will be attending to make a personnel appearance. With 500 + people already joining us on the road and over 5000 people making their way to Atlanta, we are sure this is going to be the largest and most Prolific Bandit Run yet! We have attached a PDF for your perusal, there are three packages which are placed for companies wishing to be part of the event depending on how much traction you wish to gain from exposure offered, with access to over 8 million followers. We are available to take your call/email with any questions you may have, bolstering your involvement in the 40th anniversary of Smokey & The Bandit. As the event is only a few short weeks away commencing Saturday 17th June, we only have another 7 days to register sponsors, so please reach out immediately! Please feel free to reach out, we can be contacted at either of the below email addresses or numbers. Be part of this year’s event, 40th anniversaries only come around once!